A new portal houses state-level research linking higher education to labor market demands. Launched by the Georgetown University Center on Education and the Workforce (Georgetown Center), the resource is part of the center's "multi-state effort to help develop information systems that integrate education and workforce data to improve policies and programs." 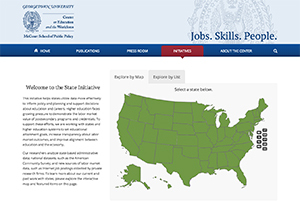 The State Initiative portal will help states and higher education systems "set educational attainment goals, increase transparency about labor market outcomes, and improve the alignment between education and the economy," according to a press release. An interactive map of the 50 states leads to individual state pages with information, reports and details on ongoing state projects. Research data includes job projections; the economic value of college majors; and sector studies on healthcare, nursing and STEM (science, technology, engineering and math) — across all 50 states and the District of Columbia. For example, Georgetown Center has released reports on the economic value of college degrees in Pennsylvania; workforce trend projections in Iowa; Virginia's workforce credentials goals; the New Hampshire Coalition for Business and Education's efforts to meet a statewide workforce enhancement goal; and ongoing work with multiple states on the value of sub-baccalaureate, baccalaureate, and graduate credentials, competency-based education and non-credit workforce programs. "As college gets more expensive, people want to know whether the investment is worth it," noted Anthony Carnevale, director of the Georgetown Center. For more information and news on Georgetown Center's latest state projects, visit the State Initiative portal here.